"Not just another 'get the girl' product"
Pick up artists be warned - this is not your average 'inner game' product. Though the course covers practical tips on dating and talking to women, the real gem of this product lies in the exercises that forces you to dig deep and confront your limiting beliefs. The programs are easy to follow and takes you through some deep level psychology which instantly gives you more self awareness of the thoughts and beliefs which guide your emotions. The course consists of 9 modules that are released weekly and takes you through the entire process at a very good pace. David is a gifted speaker which makes listening and absorbing his teachings a lot easier and fun. It is interesting to learn about the origins of the concepts behind Invincible and how it intertwines with eastern philosophy and ancient practices. You can tell a lot of research, reading and studying had been taken on David's part to condense all of that knowledge into this program. Invincible takes all the essentials of ancient Chinese wisdom, meditation, eastern philosophy, dating, relationships, developmental psychology and wraps it into a giant burrito for your soul. Implementation can be difficult but this depends on the individual. 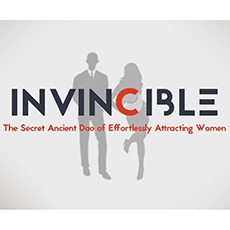 Invincible does not require you to go out and approach women incessantly and can be covered at the comfort of your home but it does require time and effort to go through each exercise properly. At the end of the day, the effectiveness of this course comes down to how you choose to use this course. The knowledge and teachings can be overwhelming so its a good thing you can keep the entire program for a lifetime. For what this program offers, it is a great value for money. David is active on the Facebook group and there is a whole community of like minded guys going through the same journey. I would highly recommend this to anyone who wants to achieve happiness and success. Fix the mind and everything else will fall into place!